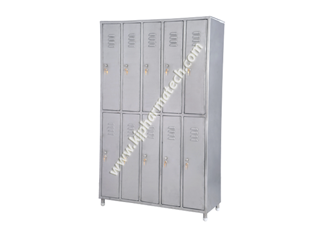 Our wide array of range Lockers for Workers are presented with safety locks, to ascertain safe and secured storage of the items and belongings. Our range SS Lockers for Worker is accessible with several designs that promote both compactness as well as offer excellent storage space because of the smart designs of our specialists. We employ premium quality SS material for the same. These are fabricated under the total guidance and supervision of experts to make certain that they are qualitative and adhere to the international standards of quality. We quality test these before putting them in the market to ensure they are robust and reliable, flawless in their make and finishing too. As a result they do not corrode, or wear off even when undergo excessive and rough usage. Hence these have enduring life and we provide them at very competitive prices as the predominant supplier of Clean Room Furniture in Gujarat.